Soak tamarind in 1/2 cup of warm water for 10 minutes and take its extract and keep it aside. Cook the tool dal adding turmeric powder, salt and enough water in a pressure cooker till done. Open the cooker and add chopped carrot, raw plantains, potato and about 2 cups of water to the cooked dal. When the vegetables are half cooked, add remaining vegetables like drumsticks, okra, brinjal, green chillies, tomato and salt and cook till all the vegetables are cooked. Mix sambar powder and asafoetida with little water and make a thick paste. Add tamarind extract and sambar powder paste to cooked dal vegetable mixture and bring to boil. Heat oil in another pan and splutter mustard seeds and fenugreek seeds. Add dry red chillies, shallots and curry leaves and fry till the shallots becomes golden brown. Add this to the sambar and mix well. Perfect sambar, would love to have it with steamed rice, some veggie thoran and of course pappadams. 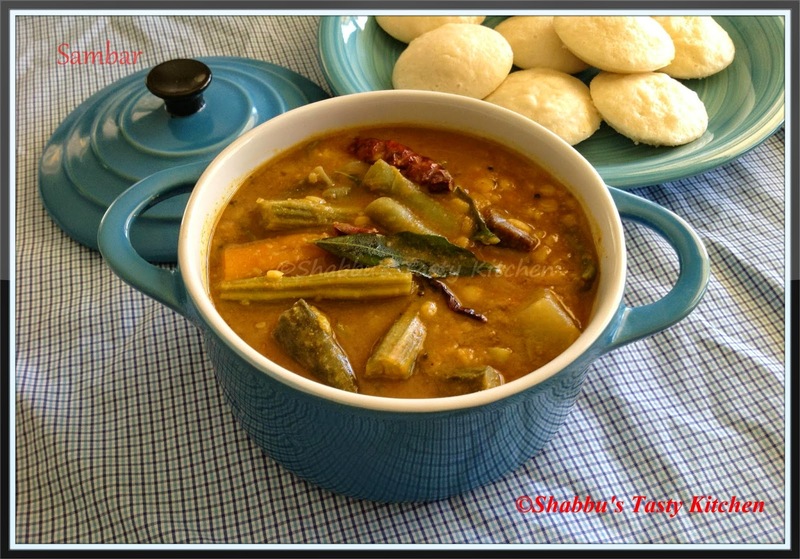 healthy and yummy sambar. looks flavourful.